After 1 good year of hiatus & celebrating its 6th year in the game, Room With A View is back in full effect with a very special 3 tracker by Kyodai, a duo that has been gathering serious momentum after highly celebrated releases on Local Talk, Exploited, Freerange or Pokerflat to name a few. The famous brother pair has proven to be working hard in the last years recording, remixing & touring extensively. Reknown for their energitic live performances & to have deliver tracks & remixes that have been played by the Who’s who of the global House scene, Kyodai have decided to choose RWAV to deliver some very personal tracks. In 2013 already, they appeared on our label with the uplifting “What You Give” that became on of the key tracks of the live sets of the last 2 years. Enjoying a long 15 years friendship with Dairmount and a common love of hybrid tracks loaded of musicality, Javi & Luis decided to lock themselves in studio last winter inspired by the idea to be the artist chosen to relaunch the label in 2015. The title Times Fly symbolises the longevity of friends that went through 2 decades of creation & exchange. And the result has been as surprising as the pair shaped up a very hypnotic & tribal red line with these new tunes. The title track “Times Fly” has been recorded in a few hours on a full moon night in their berlin studio, managing to induce a perfect balance of melancholy & tribal rhythms. Quite different of their usual sound signature, the track got everything to conquer the hearts of many different dj’s & listeners this summer. “Sacred Ritual” is born of the idea of creating a special tool for Panorama Bar (where the pair just played before their studio time in january) and focusing on the power of drums & percussions. 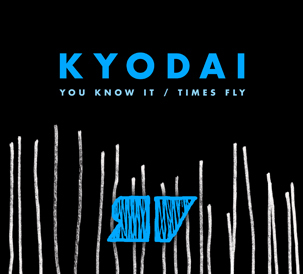 Finally, “You Know It” is reminiscent of their classic Kyodai sound epitomised by their hit Breaking with filtered basslines & catchy samples. The track has been one of the big crowd pleasers of their recent live sets. “i really think that this is the most interesting release of Kyodai so far. You can hear some recognizing Kyodai sounds, but they are arranged in such a nice and evolving way. This release works as a whole, the tracks seem to coalesce, which is amazing.